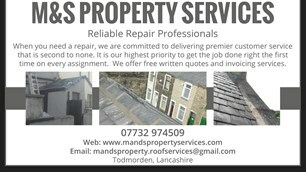 M&S Property Services - Roofer based in Todmorden, Lancashire. I am Mark, I have a family run business which has been up and running for 5 years so far. I have 20 years experience in roofing, gutter work, plastering, all types of repairs along with maintenance of all types. We complete jobs from gutter repairs to replacing roofs, we are also fully skilled at conservatory roof replacement. I provide insured quality roof and handyman services. Any questions or estimates. I offer written quotes and emergency roof repairs, just give me a call.